As chip technologies continue to scale, the aspect ratio of the metal lines and contacts becomes more challenging. As part of a recent effort, Semitracks has compiled information regarding the width, thickness, materials, and processing steps for the lowest metal layers in the upcoming 32 nm and 22 nm semiconductor technology nodes. The lowest metal layer (metal-1) constitutes the most difficult layer on the IC for probing and obtaining signal information. However, it is one of the most important layers to probe to ensure proper chip functionality and implementation. At the 32 nm node, the industry is still planning to use tungsten contacts to silicon. The aspect ratio of the contact can be as high as 9-to-1. Although some are working to switch to a lined copper contact to silicon at 22 nm, this is not likely. To accommodate a 22 nm process, tungsten contacts need a scaled titanium nitride liner deposited by Atomic Layer Deposition (ALD) and a scaled tungsten ALD seed process, followed by tungsten Chemical Vapor Deposition (CVD) fill. Although logic devices may have high-aspect-ratio contacts (up to 9-to-1), the stacked capacitor DRAMs push the envelope for this process, with an aspect ratio approaching 20. Several parameters correlate to the width and thicknesses of metal interconnect. The most critical parameter is resistance. The continued scaling of interconnect reduces the cross-sectional area of the metal, increasing its resistance. This resistance problem actually grows at a rate faster than the rate of scaling because of current limitations with barrier technology. The extension of the copper/barrier structure to 22 nm will not be simple. The increasing resistance of copper at reduced cross-section, as well as grain boundary and surface scattering effects, will mean that the traditional Ta/TaN/ copper structure will likely not scale well to the 22 nm node with its 40 nm metal-1. 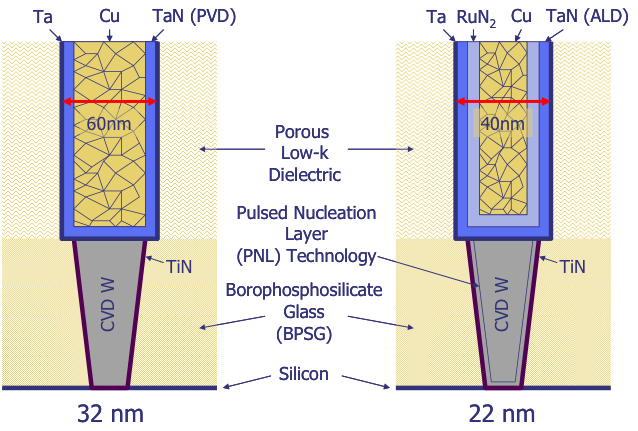 To date, the industry has not figured out a method to scale the PVD TaN liner thinner than 8 nm. The other leading technique, ALD, does not produce an effective barrier because it does not adhere to copper. This is currently an area of significant work at leading edge manufacturers and equipment suppliers. Engineers are working on a dual material barrier that uses ALD TaN as the first layer, and then ruthenium (Ru) or RuN2 as the second layer. Copper does adhere to Ruthenium. Engineers are also pursuing silver-copper and silver-manganese alloys. With ionized Physical Vapor Deposition (PVD) processes, the TaN barriers can be scaled to ~8 nm. ALD TaN does not adhere well to copper. Ruthenium is considered a good adhesion layer, though it is a poor copper barrier -- so a TaN or TiN barrier would still be required. If it is properly deposited, copper can be directly plated on ruthenium. There are many development efforts aimed at bringing a Ru/Cu-based interconnect into production. Both silver (Cu-Ag) and manganese (Cu-Mn) alloys are being considered for improved interconnect reliability. Upon annealing manganese, a self-forming MnO barrier with superior reliability forms. Both alloys have a small negative impact on resistivity. Another critical parameter is capacitive coupling. Capacitive coupling affects both circuit operation and signal extraction. Researchers are reducing capacitive coupling through the use of dielectric materials with ever lower dielectric constants. To reduce interline capacitance, low-k materials with k in the 2.2–2.5 range will be integrated at the 22 nm node. These materials are likely to be porous low-k materials, such as Hydrogen Silsesquioxane (HSQ) and Methylsilsesquioxane (MSQ), or possibly a polymer dielectric, like cross-linked polyphenylene (SiLK) or Bis-benzocyclobutene (BCB). Another alternative is air gap approaches, most of which involve thermal decomposition of a porogen material. Low-k materials are thermodynamically unstable and mechanically weak (the lower the dielectric constant, the weaker the material). Plasma damage is a big issue with porogen low-k dielectrics at 22 nm. Furthermore, porogen materials also suffer from water uptake. Scientists at NEC are working on a closed-pore material that may not need the barrier layers that porogens need for protection. Finally, integration with the assembly and packaging processes is critical with all these processes. The image on the first page shows a likely scenario for the 32 and 22 nm nodes. In the past, the industry had working techniques and processes for nodes 2-3 generations ahead of current production. That is not the case anymore. The 22 nm node is only 2 generations away, and a number of the interconnect processes are still undetermined. It will be interesting to see how this transition unfolds. Very low voltage (VLV) testing, developed by Ed McCluskey and Hong Hao at Stanford University, is based on the theory that defective circuits will exhibit failures more obviously at low power supply voltages. While an IC with a subtle defect might work at its nominal operating voltage of 3.3 volts, it may not work correctly at 1.5 volts. Therefore, the difference in circuit performance between a defective and a defect-free circuit can be enhanced at low voltages, and, as a corollary, a test at low voltages is more likely to detect a problem. This technique is potentially useful for catching problems related to defects on chips. It may not be as useful for problems related to process variations or design/manufacturing interactions, but this has not been explored in detail. 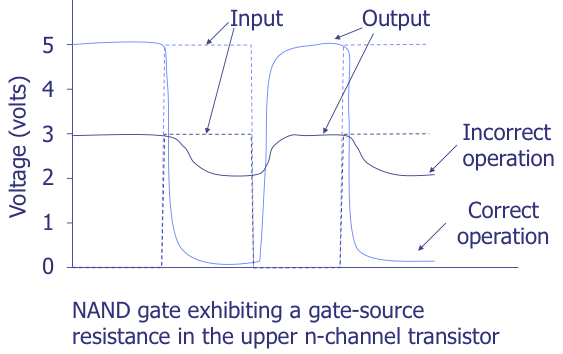 In this graph, we assume a gate-to-source resistance is in the upper n-channel transistor in a two-input NAND gate. When the device operates at 5 volts, the output switches correctly with the input. When the device is operated at 3 volts, the output does not switch correctly. Instead, the voltage remains at a level that would constitute a logical high value to the next input stage. If we assume that the gate-to-source resistance is attributable to an oxide defect, the defect grows worse with time, lowering the gate-to-source resistance until it becomes a logical failure at the regular operating voltage. McCluskey and Hao did an experiment to try and prove this hypothesis. They tested 148 ICs at 6 volts and 2 volts. All of the ICs passed functional and parametric testing; however, one failed at 2 volts. The majority of these ICs also failed IDDQ testing. The 148 ICs were then burned in at 125°C for one week. After this test, the one IC that failed at 2 volts also failed at 5 volts. McCluskey and his graduate students performed similar experiments several years later on 9 ICs that failed VLV testing. The 9 ICs were burned in at 125°C for one week and tested again. Two of the 9 failed just 6 hours into the burn-in. Based on the data, the test appears to find problems. However, the question remains: is VLV more effective than burn-in, and can it replace an expensive test like burn-in? If it did, it would be much more cost effective. A VLV test does not require chambers and can be performed in a manner of seconds. While the test could certainly supplement burn-in, it is probably not a replacement for it. Q: Devices are expected to withstand some amount of voltage/current stress; that's why input protection is included in all designs. How can I determine if EOS/ESD damage results from excessive stress conditions, a manufacturing defect, or an abnormal process variation? The question pertains to already damaged units, not virgin units. A: I would suspect an abnormal process variation if the device fails in a manner (exhibits damage in a location) that is inconsistent with the results from the in-house EOS/ESD testing. For example, the customer return device might have failed due to a gate oxide rupture, but NSC testing on comparison ICs indicates that the ESD clamp always fails. However, this cannot necessarily be determined by examining the damage site. One can envision a defect in the ESD clamp that causes a failure in the customer device. Maybe it simply fails at a lower voltage than it should. Your best bet is to characterize ICs from the same lot, or even from the same wafer, to see if they fail in a manner similar to the returned IC. Please visit http://www.semitracks.com/courses/photovoltaics/photovoltaics-technology-and-manufacturing.php to learn more about this exciting course!